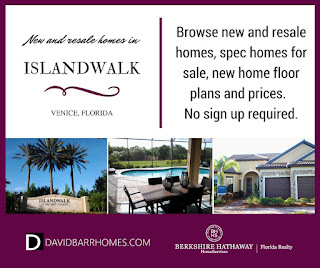 New construction paired villas are returning to the menu of home choices at popular Islandwalk in Venice. Two new Garden Series villas are available: the Seagrove and the Cascadia. 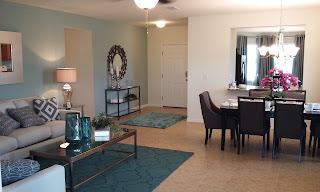 Each offers 2 bedrooms plus flex room, 2 baths, and 1448 to 1602 square feet of living space. Islandwalk has five "quick move" villas set for December 2016 occupancy. Prices start in the $190's and fully optioned should price in the mid $230's. 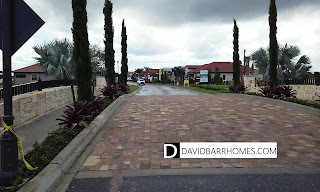 You can view all Islandwalk resale homes and builder spec homes for sale on my website. Please contact me for a tour. 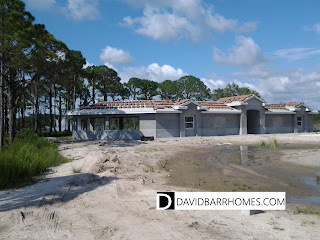 Rapalo, the newest new home community in Venice, is taking shape very quickly. The sales center is now open in their first model home. I am impressed by the open flow of the living and dining area, and the generously-sized eat in area in the kitchen. It feels like a lot of house for the money. Rapalo homes are budget friendly, and you get some nice upgrades at no extra charge, such as granite in the kitchen and paver driveways. The first phase of Rapalo will sell even more quickly now that the model home is completed. I wouldn't be surprised to see the best lots in this section sold by the end of the year. Rapalo will have a nice community pool and low HOA fees of $175 per month, with prices starting in the $230's. Please contact me for a tour or for more information.